Polyurethane Services can foam inject to your needs using our metered machines and timed pour gun. Rigid polyurethane foam is designed for general thermal and sound insulation; marine floatation and void fill. The high percentage of closed cells provides low water permeability. We also supply Pour Foam Kits in an easy DIY pack with full mixing instructions or watch the video tutorial below. 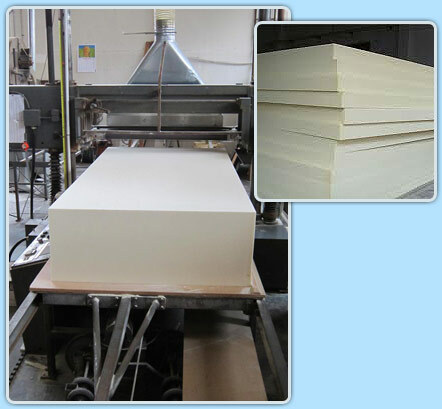 Polyurethane Foam Sheet can be supplied in a variety of sheet sizes and thicknesses. Polyurethane Foam Sheets provide excellent insulation with low thermal conductivity, the closed cell content allows very low water permeability and moisture absorption. Used as an insulation material to prevent heat loss or gain, as well as moisture protection. At Polyurethane Services we produce our own Foam blocks and can cut sheet polyurethane from 10mm through to 600mm in thickness. All sheets are 2400mm x 1200mm.